Follow the link to check out the article written up of me in the Anniston Star December 18, 2009. "THE HOMEPLACE is a marvelous gem, each song a facet that sparkles brilliantly on its own, but as a whole Abby has created something of great value." "Abby Parks mixes secular and religious themes on The Homeplace, blending them with strong songwriting, an earthy voice that is intriguing and comforting and a story-telling style that is appealing and accessible. Where Faith is an issue on The Homeplace, it's simply an honest expression of Parks as she is rather than attempt to proselytize; the honesty and unassuming grace is refreshing. Musically, the album is highly crafted and perfectly presented. Abby Parks is a distinctive talent. If you like pure singer/songwriter and Folk material, then The Homeplaceis definitely for you." 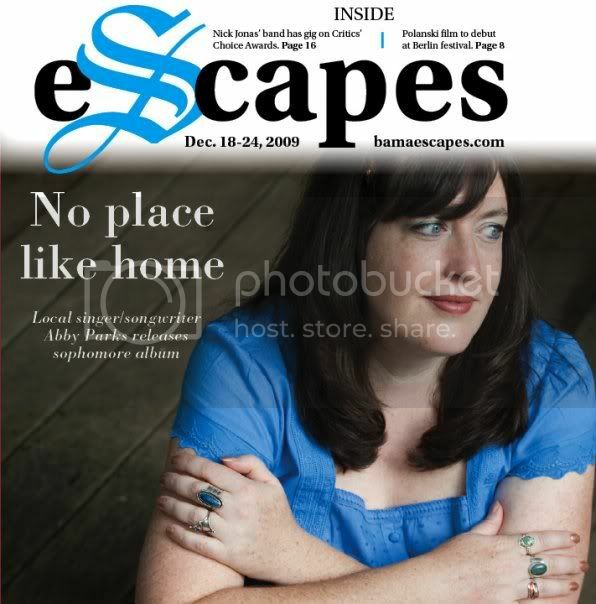 Article written about my album release for THE HOMEPLACE from Oct. 15, 2009. This copy is for your personal, noncommercial use only. You can order presentation-ready copies for distribution to your colleagues, clients or customers here or use the "Reprints" tool that appears above any article. Order a reprint of this article now. Published: Friday, October 16, 2009 at 6:01 a.m.
Abby Parks will perform at MoonSong Saturday. MoonSong Music Acoustic Songwriters Café is the site of a CD release party Saturday for Alabama folk/acoustic singer/songwriter Abby Parks. Parks’ sophomore CD, “The Homeplace,” will be celebrated starting at 7 p.m. at the café, 1000 Noccalula Road, Gadsden. is $5. For directions to the venue, call 546-1177 or visit www.moonsongmusic.com. Parks has a range of technical musical training, with years of formal education in everything from classical guitar and piano to composition and creative writing. Parks brings to that an extra edge of a deep devotion to God, a burning desire to tell stories and a passion for music and performing. Born in Durham, N.C., Parks developed an early interest in music by listening to the records her music-loving parents often played, such as Joni Mitchell, Fleetwood Mac, The Beatles and Emmylou Harris. She also listened to the popular music of the 1970s and ’80s. A German classical guitar found its way into her hands at an early age, and another facet of her passion — writing poems and short stories — began to blossom. The guitar prompted Parks’ intensity to write songs. In her high school years, Parks was further inspired by noted classical guitarist John Michael Talbot. Parks studied at Colorado Christian and Jacksonville State universities. She majored in classical guitar. Other studies included private training in composition, piano and voice. She also enrolled in creative writing courses during high and achieved bachelor’s degrees in music performance and English. Among her first solo performances was a show at the 2000 Celtic Connections Festival in Glasgow, Scotland. Parks is a private guitar teacher at Donoho School. She is a member of both the Folk Alliance and the Roots Music Association, and through the years, she also has learned to play bass, mandolin and banjo. Copyright © 2014 GadsdenTimes.com — All rights reserved. Restricted use only. "Give it up for Abby Parks, an artful writer and guitarist with a voice that could very well part the sea of kudzu leading out of Jacksonville, AL. With her debut cd, The Homeplace, Abby doesn’t hang her hat on just one peg but shows this is indeed her album musically, vocally and lyrically—quite the tri-fecta, and she scores on all points." "What marks a musical project as authentic is its degree of humanity--- and a new disc by Abby Parks touches several bases familiar to anyone of a reflective nature, through its ten tracks of stories, observations, and character sketches. Anchored solidly by a foundation of unerring and imaginative instrumentation, Parks' mid-range vocals sail powerfully on a confidence born of belief in her material. She draws from her own family histories to populate the narrative arc of her best tunes--- the war-era homefront of "Lambert Road", the ominous man-and-beast tragedy "Wild Dogs", and the title song itself, a joyful scrapbook celebration of her forebears' household. Parks casts herself in different guises to offer reflections on more specific themes--- she's a Paleolithic aboriginal in the grip of wary isolation, a frontier belle fantasizing love with a mysterious drifter, a blank and detached tabloid editor justifying the corrosive effects of contemporary celebrity worship. Maybe it only seems this way to an older set of ears, but the album stands as a sampler of influences from a treasured selection of folk/pop performers dating as far back as the '70s--- whether intentional or not, several tracks bring to mind, by tone, melody or lyric, specific seminal artists whose finest work set the standards for what has come since. Woven throughout the record are aural traces of some groundbreaking women writers--- Sandy Denny, Kate Wolf, Linda Thompson... along with recalls of more unique stylists Juice Newton, Kristen Hall, and Caroline Aiken. This ain't at all bad--- it's more a delightful suggestion of flavors, akin to detecting that someone across the street is baking cinnamon bread, or grilling steaks. Production is first-rate on the record, above all a clean mix, with judicious application of unusual effects and atmospheric touches. The songs are melodic, with just enough unexpected chord changes and tempo breaks to keep the repertoire engaging. Our only reservation is with the tendency to use nine words when six might do, and an occasional too-stately enunciation of lyrics, in place of the more relaxed and casual delivery that's sometimes called for. Small quibbles, though--- this CD shows a lot of focused work and natural talent, and indicates that there are even better things to come from this quickly developing artist." "I once had a sweater that fit so perfectly, so soft, so comfortable. I'd wear it every day, regardless of the weather. That sweater comforted me through many years. Abby Parks' new album "The Homeplace" reminds me of that long lost sweater. Every thread on this album weaves through you with shimmering guitars, strong vocals and stories that bring you back to the place you call home. With the sad state of commerical radio today, an honest recording like this is a warm welcome. Abby's wise, reliable vocals lead the way on each track as her perfectly crafted guitar parts follow her to the homeplace of love, family and life's journey. This album has many gems, but I have to give immediate attention to the beautifully crafted "Wild Dogs". There is absolutely no possible way to listen to this song only once. When I first got the cd I played this track an even seven times. I hummed the song for at least a week. This is the best song of 2009, end of story. This is a grammy-worthy performance and a story that captivates the listener in every way. The opening guitar riff sets the tone for a story that only Abby could tell. This song belongs in a movie. "It must have been the wild dogs. Don't you ever trust those wild dogs. I should have shot them all myself, the wild dogs. And I will always blame those wild dogs." Abby is the Jack London of female songwriters today. If I had to pick one singer today to travel uphill in the snow with me, it would be Abby. Other standout tracks on the album are the gorgeous "Birthed of Fire and Water" and the haunting "Lambert Road." But these are just a few delicious, golden apples in a basket brimming with fresh fruit. Abby's voice is a guide, like the American highway. Like the sturdy bow of grandpa's boat. Like the feeling of fall. Like that warm sweater I loved so much." Multi-talented songstress and Alabama resident Abby Parks graced the Woodstock Coffeehouse Friday night with her music, filling the air with her unique sound. She brought with her a small army of supporters, including Sandy Serge of Serge Entertainment Group. "Abby rocks," Serge said. "I love the variety with all the instruments. I would come to see her again." Parks played the guitar, banjo and harmonica with equal expertise, creating a musical set that was varied and captivating. "I play guitar, 12-string guitar, mandolin, harmonica and most recently have been performing with the banjo, too. My strongest skills lie with the guitar as I have played it since a young teen and studied classical guitar in college. But I am really enjoying applying my finger-picking skills to the banjo," Parks said. Audience members were delighted with her performance, admiring her soulful musical style. "She has a very soothing voice," said one listener named Maggie. "Abby writes much of her own music and sings from the heart," said another attendee named Scott. These compliments are only some of many Parks received during the evening. Parks describes her own style as similar to Joni Mitchell's. "I used Joni Mitchell's style as a model when I was younger and had begun songwriting, loving her use of alternate tunings, stellar finger-picking and unusual chord choices," Parks said. However, she is far from a copy of Mitchell. "I have worked on developing my own style so that I am unique," Parks said. "That was I have been true to myself, and that is important as an artist if you desire to stand out." Parks' sound includes mainly finger-style guitar that she uses to develop her own exceptionally interesting chord progressions. "I love to stray into other keys, or at least tease the ear with a chord that goes outside of the key I am in," Parks said. Though she is resides in Alabama now, Parks has also lived in Germany, Maryland, Colorado and the U.K. She often travels to Georgia for musical obligations, but her love for Georgia is deeper than that. "My relatives and roots lie in the South, mostly Georgia, so in a way I think of it as home even though I haven't lived here since I was a child," Parks said. "I'd say the music scene in Alabama is not as thriving, so I enjoy coming to sing in Atlanta." She also loved the atmosphere of the Woodstock Coffeehouse, saying that she felt at home. "I'd say my favorite aspect was the hospitality. Many coffeehouses that offer live music seem to become blasé about the performers and treat you as if you are just one of the countless entertainers. I'd say it was one of the best experiences I've had in a coffeehouse," Parks said. Her choices of musical venues are not limited to coffeehouses, however. "I play festivals, songwriter showcases, and special events mostly. I don't sing much in bars, as I prefer a more intimate setting. I love doing outdoor festivals and seek folk festivals especially," Parks said. She is a member of the Folk Alliance, and attends regional conferences for the opportunity to play in artist showcase settings. Parks has released two CDs, one in 2005 and the other in 2009, and said she hopes to continue recording in the future. Her second CD, The Homeplace, was recorded at Soundcell Studies in Alabama by illustrious producer Doug Jansen Smith. Smith has also produced for Bryan McKnight, Phil Collins, Willie Nelson and Bonnie Raitt. "It was an awesome experience. Dave Anderson of the Atlanta Rhythm Section played on some of the tracks on the album," Parks said. "(Abby) is able to make the necessary matured songs that have an inner strength that can grow in any direction. " "This is a very impressive debut from an obviously gifted songwriter and guitarist. WESTERN DESERT SUN is about as close to a debut masterpiece as you will find. Textured landscapes of cactus, prairie wind and some fine, delicate guitar playing accompany Ms. Parks on a journey, which I am happy to say, is just beginning. Keep an eye on Abby, as it appears that her music will be around for a long time." "The music is just amazingly beautiful with powerful lyrics that stimulate and uplift you. This CD goes everywhere with me now. The music is very melodic and the vocals on these tracks.. EXQUISITE!"